The mosque and the guest pavilion are the two red buildings on both sides of the Taj Mahal's mausoleum. They are supposed to be totally identical, for a question of symmetry, but in reality they differ slightly from each other. Both are on the "Chameli Farsh", the name given to the 9m high terrace at the end of the Taj Mahal complex which contains, besides the mausoleum, the mosque and the guest pavilion, two ponds filled with water, between the annex buildings and the main building. Quite logically the mosque is the building located to the west, towards Mecca. 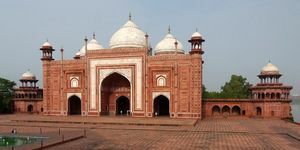 It is a red sandstone construction inlaid with white rectangular marble. Each corner of the rectangle is equipped with an octagonal turret, rather narrow, ending with a chaatri (a kind of typically Hindu kiosk). On the roof are 3 domes, one in the center and two on the right and left. They are identical except for the size, the central dome is larger than the other two. They look like two drops of water to that of the dome of the mausoleum, with two decorations each. A decoration at their bases, consisting of two lines of geometric patterns, and one at the top, an inverted lotus. The lotus is a symbolic flower in the Hindu religion, it marks the continuity of life, the adaptation of man to his environment, renewal. Each chhatri and dome has a bronze arrow pointing to the sky. The mosque has three entrances. The main one is in the center, you enter through a wide iwan (wide porch, high and shallow typical of Persian architecture) decorated with black marble inscriptions on a white marble headband. These are Koranic inscriptions as there are on the mausoleum. There are also stylized flowers, also like on the mausoleum. They are made of pietra dura, a technique of incrustation of stones on a stone support (lapidary marquetry, therefore). This technique was developed by the Florentines during the fifteenth century, it is they who came here to Agra, to make these ornaments. The other two entrances resemble the main entrance, they just do not have the iwan whose decorations are carried directly above the door, so they are more modest. Each of the two entrances to two false windows above, both identical in ogive. The rest of the walls of the mosque are richly decorated with marble inlay. The motifs are mainly floral and plant, sometimes it is simple geometric patterns. The whole is of great symmetry and the overall impression is beautiful, the mosque of Taj Mahal is of great beauty. Internally, as it is a mosque in use, it is equipped with the necessary to the practice of Islam: The wall of the bottom is endowed with a Mihrab, which is a kind of niche on a human scale surmounted by a semicircular vault. The Imam (the officiant) stands in this place which symbolizes the most sacred point of the mosque. By comparison, in a church it is the choir, a place where the faithful do not surrender. The mosque also contains the Minbar platform from which the priest delivers a speech. The Taj Mahal Minbar is on the right side of the Mihrab. The floor covering in the mosque is made of prayer rug, there are in total 596 places. The interior is as decorated as the exterior, there are many verses of the Koran which are inscribed on the walls, in incrustation. The mosque also has a small stone room of 5.5 x 2m, which was used to protect the remains of Mumtaz Mahal during the few days before his burial, after being brought to Agra. Finally, the basin in front of the mosque, between it and the mausoleum, is used for preliminary ablutions to prayer. The Mihman Khana, known as the guest house, is the second building on the terrace and east of the mausoleum. Very close to the mosque, it differs in small details. 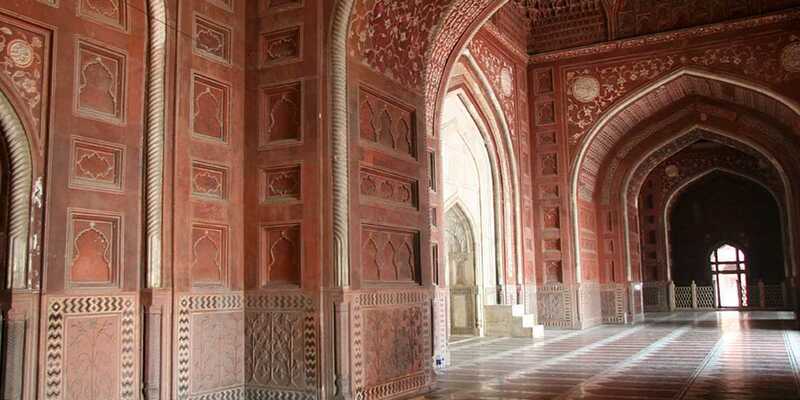 It is devoid of Mihrab and Minbar, and the floor is made of simple slabs of red sandstone. 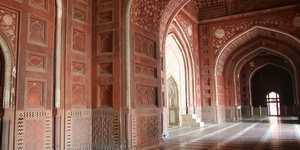 Moreover, she does not have this small room that welcomed the remains of Mumtaz Mahal, as on the mosque. But she has the same basin for ablutions, although in her case it is only decorative. The interior is only a large room without walls of separation. The guest house is pretty well preserved. The Mihman Khana, also known as "Naqqar Khana" or "Jawab" was originally used as a rest home for guests on the anniversaries of the death of Mumtaz Mahal. It also served as a gathering place for those who came to pray in the mosque or directly on the deceased's tomb. For those who are still wondering, know that the guest house can not be converted into a mosque because the building is turned from the east, while in India, the mosques must be turned to the west. But since the builders wanted perfect symmetry, they had to choose to have only one real mosque. Regarding the dimensions, each of the two buildings is 60m long and 30 wide, a length-to-width ratio of one third.